I'm a little late with this, but Mike's GREAT Aunt Dorothy just celebrated her 88th birthday. We all went out to dinner with her and shared some excellent carrot cake. I love you very much. I love you no matter what you do. Even if you move away, I'll still love you. I'm so glad you invited me to your party. 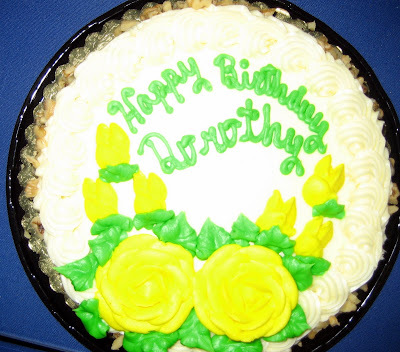 Happy Birthday Dorothy. Is that not the cutest thing ever? Even cuter is watching Shelby interact with Dorothy. She hugs and kisses her ... warming Dorothy's 88 year old heart! 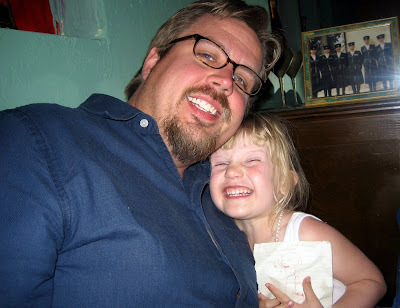 Here are Shelby and Daddy at the birthday dinner. Gotta love that smile.